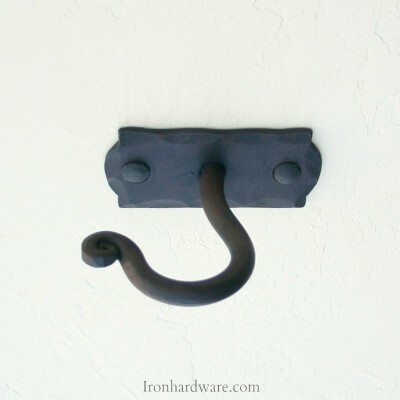 Our Iron Curtain Rod Mounting Brackets are hand forged by skilled artisans in our Paso Robles CA design studio. They come in Old World, Rustic, Traditional, and Contemporary Styles, finely finished to add elegance to your decor. 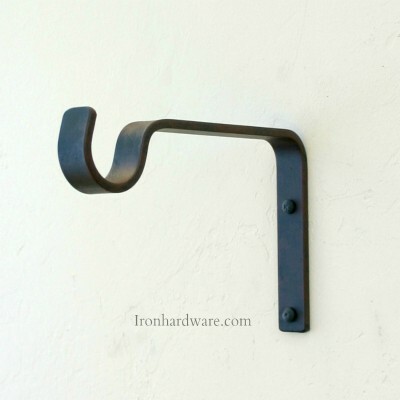 Mounting Brackets are the supports which attach your wrought iron curtain rod to your wall. The number of mounts is based on the length of your rod, however, we can adjust to fit your particular application. Please add notes in the comment section at check out so we may address any concerns, and build your curtain rods to meet your exact specifications. 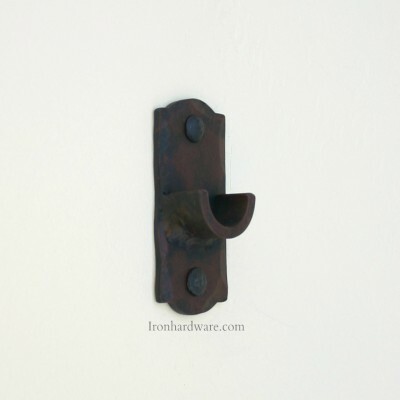 Our hand forged Standard wrought iron mounting bracket is very sturdy, yet clean and discreet. Great choice for any modern, industrial, clean, discreet, or contemporary design. 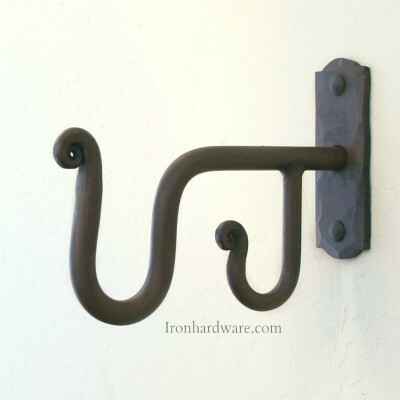 This wrought iron hook can be used for a variety of purposes.3.5" projection makes it a good choice when a center mount is called for on our return rods. 4" wide x 4" high. Fits 7/8" rods. This is our most popular hand forged wrought iron mounting bracket for curtain rods, It is beautifully rugged, and very heavy duty. 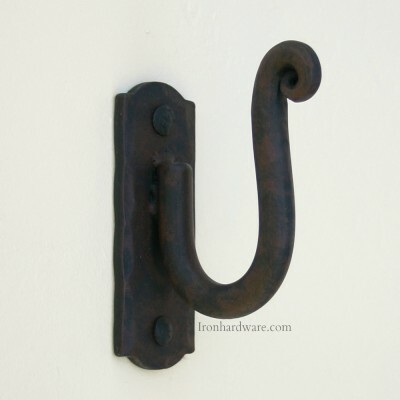 This classic wrought iron hook can be used for a variety of purposes.Forged from 3/8" solid iron. 4" high x 5" long, 3 1/2" wall to rod center, plate is 3.5" x 1.5". Fits 7/8" rods. Old World Ceiling Mount Our hand forged Old World Ceiling Mount is elegant and stylish yet sturdy enough to hold any curtain application without stress. The standard mount will set your rod 1" to 1.5" from the ceiling, custom sizes are available. Fits 7/8" rods. Old World Tapestry Mount. 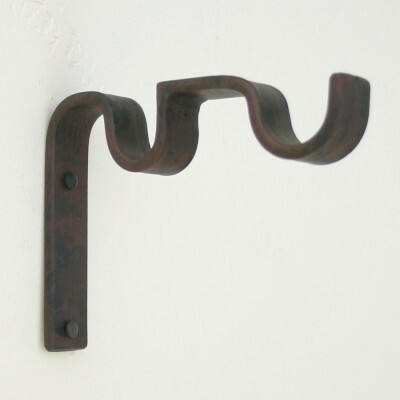 Select these Decorative Brackets for any tapestry, curtain or wall hanging you want to hang close to the wall. 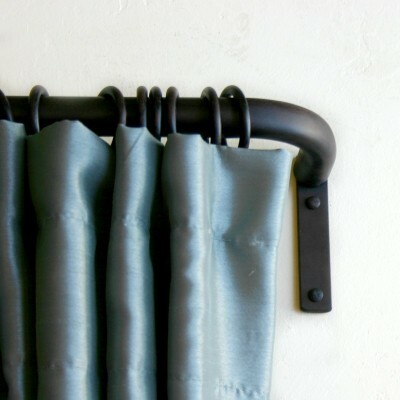 (1" between wall and curtain rod, not recommended for most curtain applications). 3.5" high x 1.5" long. Fits 7/8" rods. 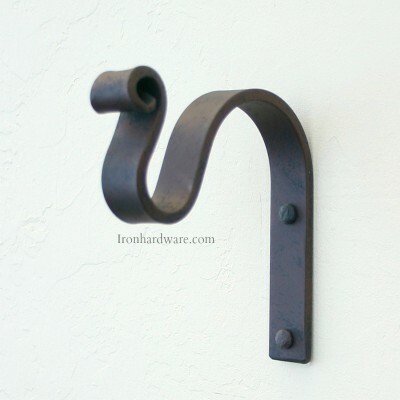 These very elegant mounting brackets are Hand Forged Solid Iron. 3/4" wide, 7" high, 5" long, 3 1/4" wall to rod center. Fits 7/8" rods. 5 1/2"H x 7"L, 5 1/2" Wall to Rod center, Plate is 4.25" x 1.5". Fits 1 1/4" curtain rods. This wrought iron end mount fits our 7/8" rods, and is used in place of a finial to allow the drapery rod to be mounted perpendicular to any surface. Measures3.5" x 1.5". End mounted rods can be used inside any enclosure, or wall to wall. Please list the actual opening size in our comment box at checkout. If you are using an end mount on one end only, order the rod with finials and note in comments that one side is end mounted. 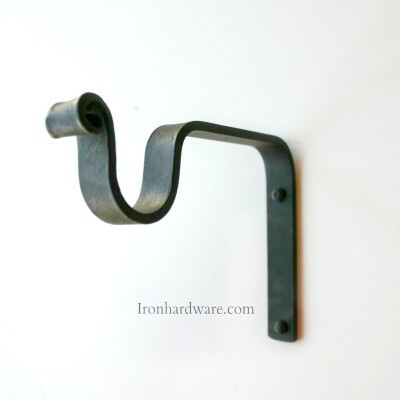 Wrought Iron Curtain Rod Mounting Bracket, Old World Style. 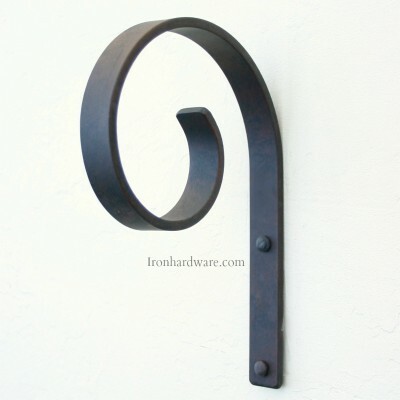 This classic wrought iron hook can be used for a variety of purposes.1.5" wide x 3.5" long with 5.5" projection. Fits 7/8" rods. Our standard style Double Curtain Rod Mounting Brackets are clean, discreet, and very sturdy. Hand forged by skilled atrisans in our Paso Robles CA Design Studio with an empasis on beauty, performance, and fine detail. Projections are 2 1/4" for the back rod and 5 1/2" for the front rod. Overall dimensions are 4" high and 6 3/4" total depth. Fits 1 1/4" rod in front and 7/8" rod in back. Works very well with contemporary style decor. Our standard style Double Curtain Rod Mounting Brackets are clean, discreet, and very sturdy. These work very well in contemporary decor. Hand forged by skilled artisans in our Paso Robles CA Design Studio with an empasis on beauty, performance, and fine detail. Projections are 2 1/4" for the back rod and 5 1/2" for the front rod. Overall dimensions are 4" high and 6 3/4" total depth. Fits 7/8" rods. 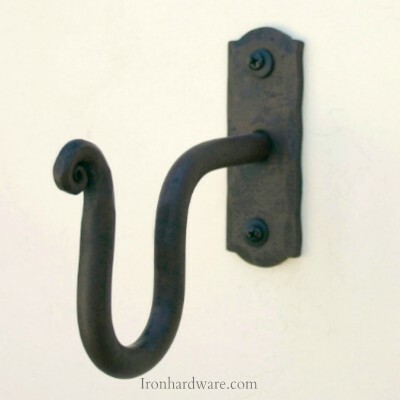 Our hand forged Standard Mount is very sturdy, yet clean and discreet. Great choice for any clean, modern, industrial, or contemporary design. A perfect choice when a center mount is called for on our return rods. 3.5" projection, 3/4" wide, 4" high, 4 1/4" total depth. Fits 1 1/4" rods. Old World style Double Curtain Rod Mount fits 1 1/4" Drapery rod up front, and our 7/8" drapery rod in the back. Double curtain rods are great for the decorative side panels or full drapes up front with light filtering sheers on the back curtain rod. 5.5" total height, 5.5" wall to rod center, 2.25" wall to sheer rod center. French Rods, Return Rods. This is the standard mounting bracket used with our very popular French curtain rods, which are also known as return rods. The rod itself bends at 90 degrees and slips on over the mounting bracket for a very clean space saving look. 3/4" wide, 3" high. Standard projection on our French Curtain Rods and Return Rods is 3.5". 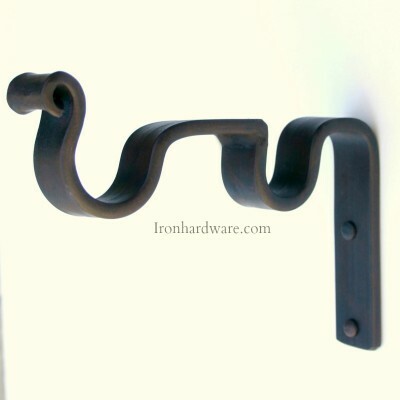 Our Hand Forged Solid Iron Traditional style mounting brackets. 3/4" wide, 5" high, 5" wall to tip, 3 1/2" wall to rod center. Fits 1 1/4" rods. 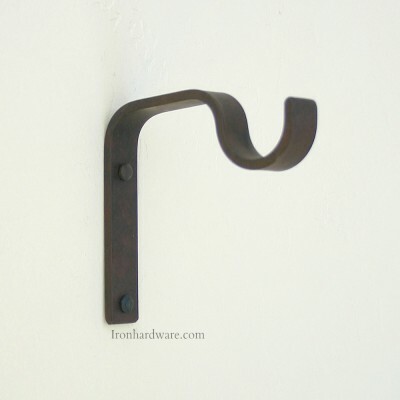 These very elegant mounting brackets are hand forged solid iron. 3/4" wide, 7" high, 5" deep, 3 1/4" wall to rod center. Fits 1 1/4" rods. 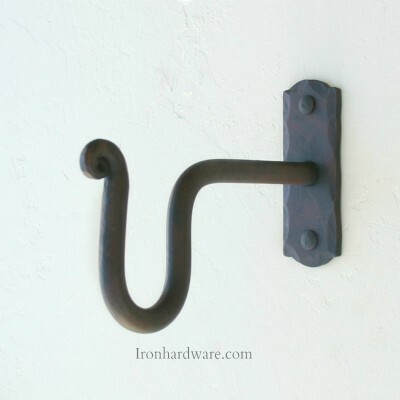 Hand forged standard mounting bracket with 5.5" projection provides more room between your curtain rod and the wall for curtains that will cover blinds, sheers, or shades.This classic wrought iron hook can be used for a variety of purposes. 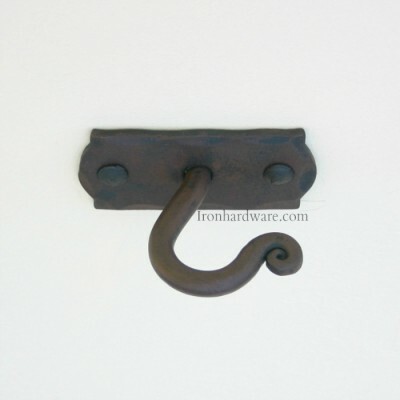 Hand forged traditional style mounting bracket with 5.5" projection provides more room between your curtain rod and the wall for curtains that will cover blinds, sheers, or shades.This classic wrought iron hook can be used for a variety of purposes. Double Curtain rods require very strong mounting brackets. 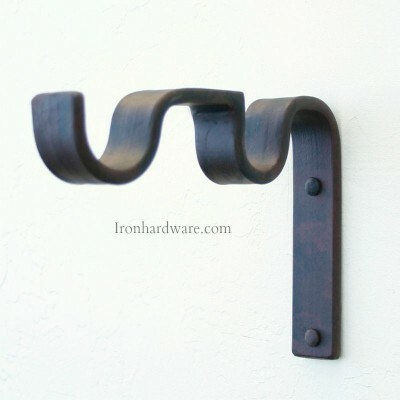 Our traditional style double curtain rod mounting brackets are beautifully hand forged right here in our Paso Robles California design studio by skilled artisans and are very sturdy to hold the weight of your double curtains. 4" high, 6 3/4" total projection, curtain rod projections are 2 1/4" and 5 1/2" wall to rod centers.Fits 7/8" rods front and back. 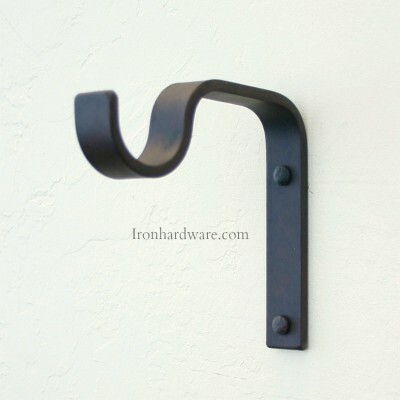 This wrought iron shower curtain rod mount is ideal for wall to wall mounting of wrought iron shower curtain rods or for mounting any wrought iron curtain rods from perpendicular walls. It allows you to inside mount your iron curtain rods and have decorative finials. Use only with Ball Finials, or end caps. 4" high x 3.5" wide. Fits 7/8" rods. 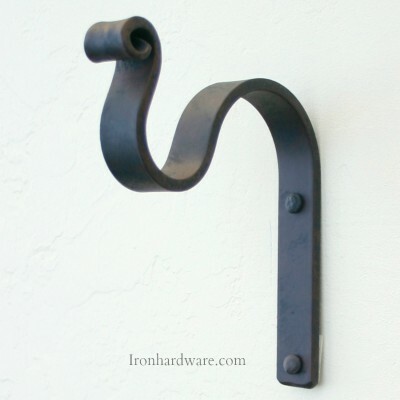 Our Hand Forged Solid Iron Traditional style mounting brackets. 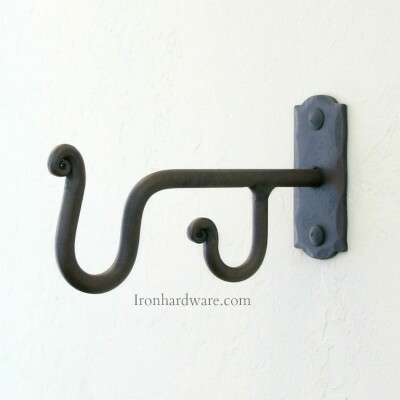 This classic wrought iron hook can be used for a variety of purposes.3/4" wide, 5" high, 5" wall to tip, 3 1/2" wall to rod center. Fits 7/8" rods. This is our most popular hand forged wrought iron mounting bracket for curtain and drapery rods, it is beatifully rugged and very heavy duty. 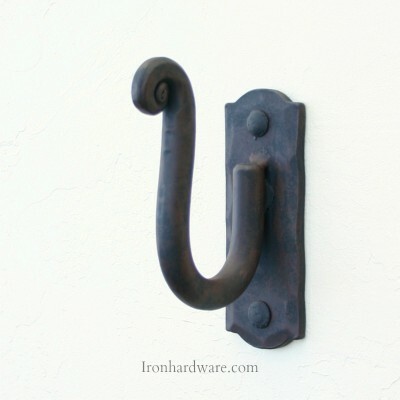 This classic wrought iron hook can be used for a variety of purposes. Forged from 1/2" solid iron, 5 1/2"H x 5 1/2"L, 3 1/2" Wall to Rod center, Plate is 4.25" x 1.5". Fits 1 1/4" rods. Double Curtain rods require very strong mounting brackets. 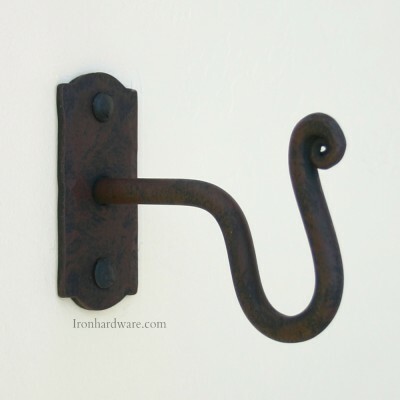 Our traditional style double curtain rod mounting brackets are beautifully hand forged right here in our Paso Robles California design studio by skilled artisans and are very sturdy to hld the weight of your double curtains. 4" high, 6 3/4" total projection, curtain rod projections are 2 1/4" and 5 1/2" wall to rod centers. Fits 1 1/4" rod in front and 7/8" rod in back. Our Old World style Ceiling Mount for curtain rods is elegant and stylish yet sturdy enough to hold any curtain application without stress. 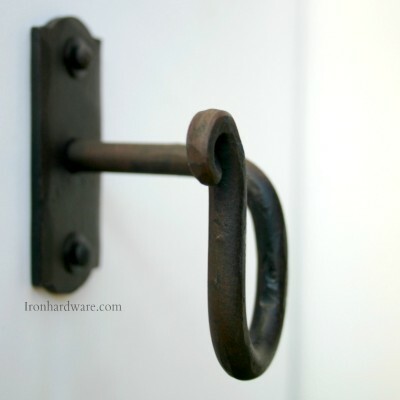 Hand forged in our Paso Robles, California design studio. 3 1/2" x 1 1/2" This mount will set your rod 1 1/2" below the ceiling or any overhead mounting surface, custom sizes are available. Fits 1 1/4" rods. 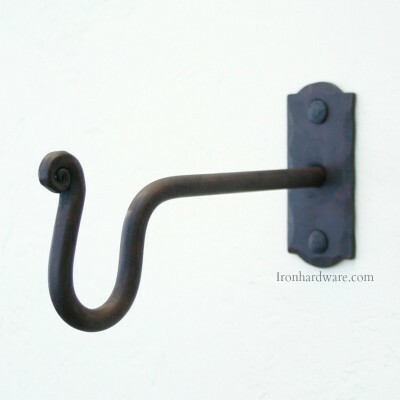 Our Old World Style Double Curtain Rod Mount holds 7/8" curtain rods front and back. Double curtain rods are great for the decorative side panels or full drapes up front with light filtering sheers on the back curtain rod. 4" total height, 5.5" wall to rod center, 2.25" wall to sheer rod center. This wrought iron end mount fits our 1 1/4" rods, and is used in place of a finial to allow the drapery rod to be mounted perpendicular to any surface. Dimensions3.5" x 1.5". Fits 1 1/4" rods. Old World Tapestry Mount shown with Iron Cross finials. Select these Decorative Brackets for any tapestry, curtain or wall hanging you want to hang close to the wall (1" between wall and curtain rod, not recommended for most curtain applications). 4.25" high x 1.5" wide. Fits 1 1/4" rods.